Our popular Chamonix snow report has been running since the season started in Chamonix in December. We bring you the latest news on the weather, snow conditions and upcoming events every Monday at 6pm UK time / 7pm French time on our Facebook page. You can find the report all week on the Chamonix All Year Snow Report page, and catch up on previous episodes of the December and January snow report in our blog. 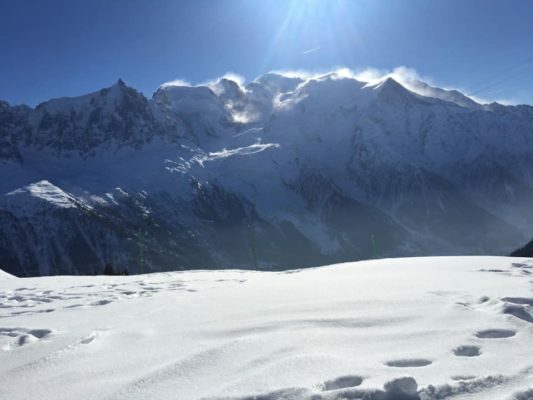 We’ll be updating this blog page in February, so you can see how the season’s developing and get a feel for the conditions if you’re planning to head to Chamonix for some mid-season skiing. The famous Azores high ridge is keeping our skies azure blue once again! In Chamonix we have three days of fair winter weather, quite cold each morning and milder each afternoon forecast through to Wednesday. 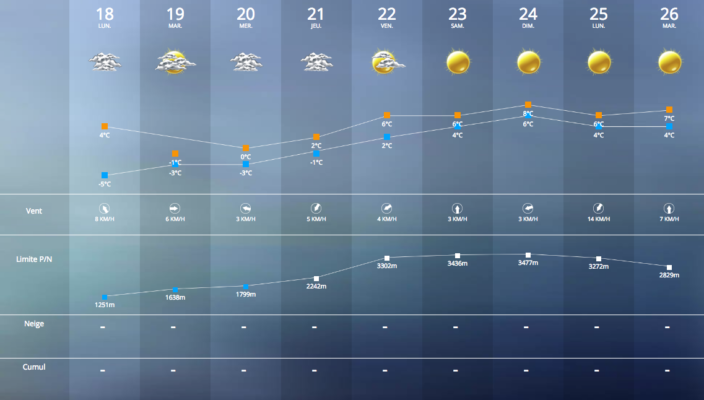 According to Chamonix-Meteo “Wintry deterioration likely between Thursday afternoon and Friday evening” and notably Wednesday has 100% sunshine in the forecast. ski-pass.com has close to 10cm of fresh snow set to fall as the cold front sweeps in Thursday to Friday. Sunshine will return briefly late in the weekend ahead of more snow on the forecast for next week. This week we pick Le Brévent for testing out terrain for all skill-sets, beginners included. 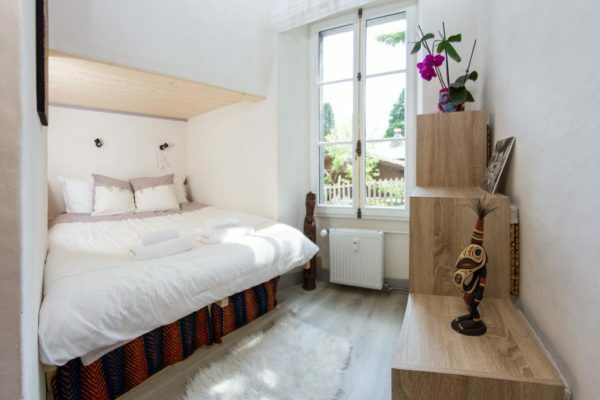 A great family-friendly choice that even connects to La Flégère with a great mix of pistes for everyone and simple access from the centre of town. Due to its south-facing slopes, Le Brévent has all day sun and now a nicely topped up home run, open for the first time this past week. 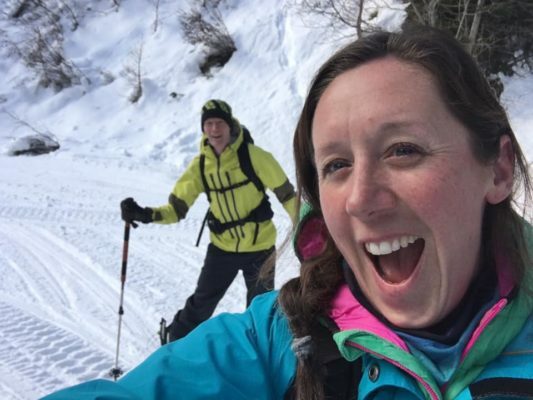 As seen in the picture above of Lisa (our sales manager) the home is fun black run that will take you back to the beginner piste Le Savoy in central Chamonix. But just like the run home at La Flégère it is a winding run that should only be taken on by confident skiers, as many fun but steep tight turns await you! We recommend you book a guide when heading off-piste in Chamonix to make the most of all our FRESH snow “#Snowmageddon”. A private guide may be your best option to experience the “back-country” at your own pace, or that set by your friend or family group. Or for experts improvements to your technique opt for the more economic choice, a certified off-piste private ski instructor, who won’t just improve your safety but also your technique, with tips from years of experience. Chamonix All Year are your local link to guides that speak many languages, and are at the top of their field. Contact our resort team today for more details about private lessons and guiding in Chamonix. It’s Chinese New Year! Happy year of the pig! The Chinese year 2019 begins today and will be short because it only lasts until January 24 2020! The Chinese calendar, unlike ours the Gregorian calendar, does not always last 365 days, but varies each year. The good thing is that the party lasts several days…. 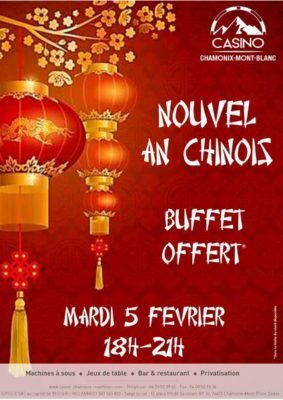 Here in Chamonix, Tuesday night from 6pm, you can celebrate the Chinese New Year at the Casino de Chamonix, where a small buffet of Chinese specialities will be offered at no charge to players. The local pro team (Les Pionniers) take on the local wannabes and old-boys (Stars74) at the central hockey rink at 8.30pm. These matches are always the wildest as the locals try to one-up each other with crazy stunts and more! 8.30pm – 10pm It’s the last session for the Torchet Night Fever! With hot wine, hot chocolate and crisp cold night skiing. Join the fun this Thursday before the lamps power down for a while. Meeting at the Maison Nordic from 6.30pm a chain of head-lamped speedy skiers line up to boost around the green nordic ski loop of Bois du Bouchet. Don’t worry there’s also a leisurely “slow lane” as this piste is nominated “green” and this event is one which is open to all levels. Just remember on the 8th at 8pm, it’s time to discover opera at the Auditorium de l’Ecole de Musique et de Danse in Chamonix (381 Rue du Lyret). This special event is like opera for beginners as soprano singer ISABELLE GALLAROTTI (accompanied by BRUNO GEORGE on the piano) introduces you to the most famous opera arias and their stories in a fun and friendly environment. Note this event is in the French language, however the arias will be in a number of languages. Tickets are 12€. This month we have drastically dropped prices at the Cocon Apartment, as seen in the snow report today (right at the end!). Weekly bookings at this property were £1000 – they are now £650 – and selling out quick! Book now here to get to the sun and snow quick! After 30cm of fresh snow fell above 2000m altitude over the weekend, another 10cm joined the party today right down to the town of Chamonix itself. 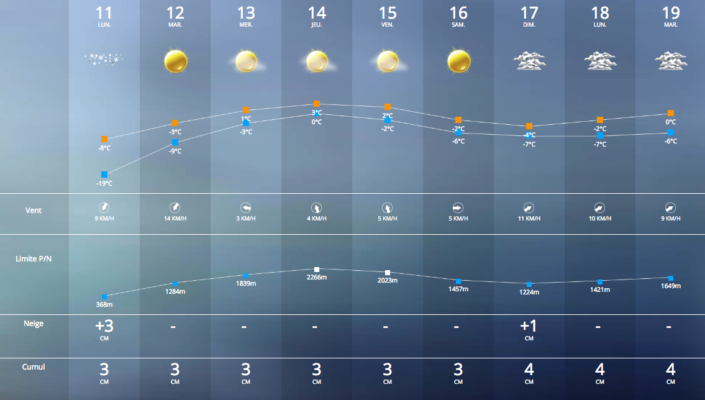 According to Chamonix-Meteo tomorrow will be “sunny, yet still unseasonably cold with fairly strong wind high up”, following that we have an “African originated high pressure component” developing from the South. This week we couldn’t help but return to Le Brévent, which was privy to the best visibility as the sun burnt its way through patchy clouds, on and off throughout the day. This is because Le Brévent has South facing slopes which means that it generally will benefit from more sunshine than say the Northern facing Grands Montets, or lower altitude Les Houches. Access: Le Brévent can be accessed easily from the center of Chamonix with “Plan Praz” cable car that runs from the area (suburb) known as Les Moussoux. The number 14 bus regularly takes skiers from central Chamonix up the hill directly to the cable car (especially handy for “little legs” in the school holidays!). On foot, if you walk in a straight line from the Tourism Office up-hill you will reach your destination. Another handy way to access the cable car is by using the drag lift of the beginners slope known as “Le Savoy”, this way you don’t have to hike the hill in ski gear, you can be dragged up it! Two lifts will be running from 5.30pm to 9pm with music, a sledding area for non-skiers and snacks/hot drinks on hand. We recommend you book a table in advance of this busy night which falls in the popular “half term” holiday period. We have made a list of our favourite fine dining spots in Chamonix here. Or for special diets and vegetarian ideas read our blog here. €63 @ Le Impossible, on Route Des Pelerins – their menu includes a welcome drink, amuse bouche and 3 courses. €45 @ Hotel Eden, in Les Praz – their menu includes three courses with a glass of Prosecco and a candle lit table and cool jazz on the background. Book a last minute family “ski’n’sun” half-term holiday ski trip now and save up to 35%! As you can see in the below forecasted barometer of ski-pass.com, temperatures are set to rise from Friday; so enjoy fresher snow conditions prior to the weekend and particularly in the morning ahead of afternoon sun strength! Leaving from the centre of Chamonix, this little red train takes you to the Mer de Glace – “Sea of Ice” – Glacier. To get to the ice cave once you arrive to the platform, take the bubble lift down to the stairs and start your hike to the cave. There are more than 400 steps between the bottom of the bubble lift and the ice cave which is carved new every year! This is due to the continued movement of the glacier since the lift was installed. On your way down, or up, you can even see the markers indicating how the glacier has retreated since the train line was completed in 1909. Recommended: A visit to “the Glaciorium” for an interactive display on the formation and geography of glaciers all over the world. This can be found by following the path left on your way out from the train, and taking another left at the “Terminal Neige” refuge. In the video the area seen is the free BBQ and “Mont Blanc Legend” play zone at La Flégère ski area. It can easily be accessed from the green piste for beginner skiers. There are many other outdoor play, and notably sledding areas, which you can enjoy in Chamonix and the surrounding area. Take a look at our recent blog explaining the best sledding spots with a map put together by “Mont Blanc Family Fun”. 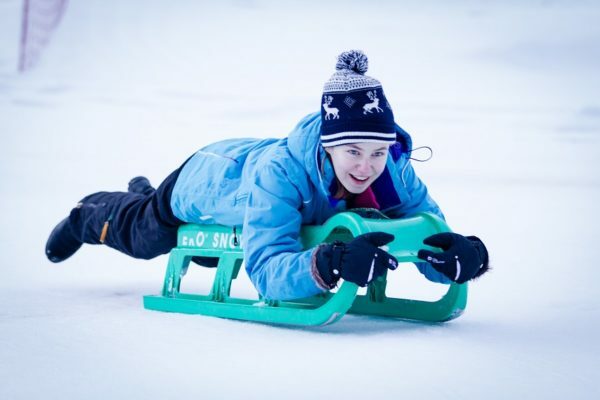 There are a number of ski schools in the valley accepting children from as young as three! For a fun and relaxed introduction skiing choose the school or instructor that has adapted lessons to your childs age and level. You can sign them up for a half- or full-day. Additional childcare is also available before / after and even during lunch as well. 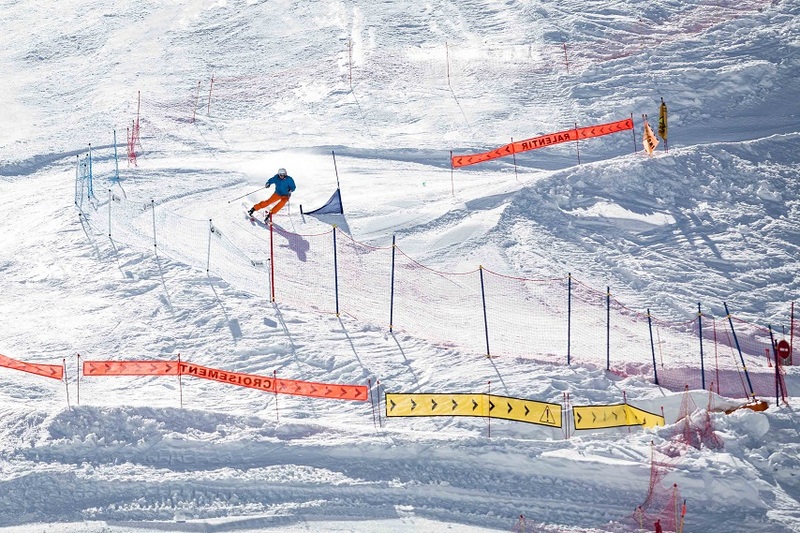 Can’t get a lesson booked for regular skiing, or looking to try something different? Try Cross Country sking, known locally as ski du fond! There are green tracks from Servoz to Vallorcine and everything in between. Plus this is the perfect sport for sunny weather days such as the ones we have these holidays. We love to recommend this blog of the top photography sites in Chamonix, but please note some of them are very seasonal. 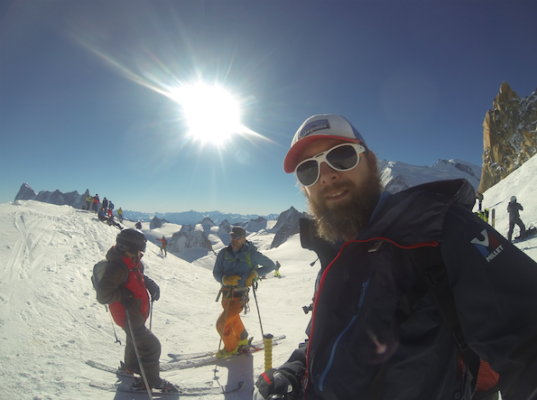 Just make sure you have your camera or go-pro on hand at all times as the sites NEVER trully stop in Chamonix! Including Huskies (SOLD OUT TILL MARCH), Paret Sledding, Parapenting, Ice Skating! Conditions are perfect at the moment to take on the Valley Blanche of Chamonix Mont Blanc. This off-piste itinerary does require a guide or instructor to be with you at all times, unless like Richard in our video you are a back-country pro! Exceptional in length and beauty, the Valley Blanche descends from the top of the Aiguille du Midi, at 3,842m altitude, along the Mer de Glace Glacier and down to Chamonix 2,800m below. We have written the in and out guide of the Valley Blanche for you here! NOTE: Since Friday last week the “Z” of the Arête at the Aiguille has been groomed and depending on conditions will be available to the public to help facilitate their access to the start of this famous ski run. The first week of the UK school holidays begins! It’s your free introduction to salsa with Luz Adriana and music from South America by her DJ. DJ Hat Swing takes you back in time to the 30s, 40s, 50’s and 60’s. It’s an evolution of the Latin night with a whole new genre of dance and music. Or more so for their parents to get a bit of peace of mind. And it’s free! Every afternoon from 2pm – 6pm this international gathering of fifty tattoo artists allows you to discover the world of tattooing, to attend live performances in all styles and even get a very permanent souvenir! Admission is free and there will also be commercial stalls, artisans and snacks. All Winter we have opened up our calendar for short-breaks, that means you can stay for dates you need without being blocked into weekend-weekend seven day holidays…and save!